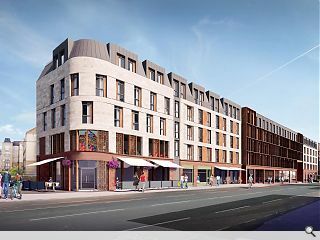 Drum Property Group have revisited proposals for a mixed-use development at Stead’s Place in Edinburgh by lopping off a single storey from the primary Leith Walk elevation. 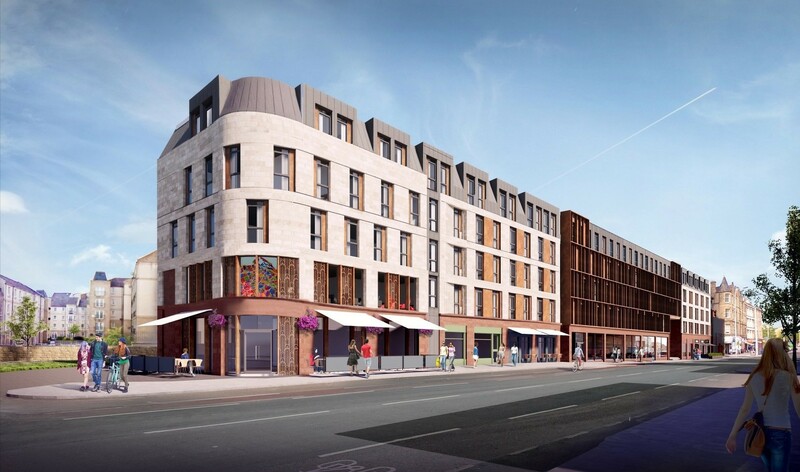 The changes have been adopted in response to consultation feedback and bring the new build into line with traditional tenement neighbours, retaining a mansard roof for visual interest and includes 471 student bedrooms, 56 hotel rooms, business units, and 53 residential flats. As before the Halliday Fraser Munro designed scheme pointing south up Leith Walk, leading pedestrians and cyclists along a revised route to Pilrig Park which now follows ‘a clear desire line separated from the vehicular surface’. Appraising planners of the modifications the architects wrote: “The revised scheme clarifies the traffic routes through the site giving a higher priority to cyclists and pedestrians while maintaining open space of over 20%. “The reduction in storey height results in a loss of 52 student rooms but cycle parking numbers have been maintained at those provided in the original scheme with a more diverse range of cycles now being accommodated. Existing gateposts and railings at the main vehicle entrance have also been retained in a nod to the sites past. that perhaps it was a tad tall considering it's surroundings. So taking that storey off to make it the same height as the surrounding tenements is a bonus and does help it sit better in its context. Would love to see the Bimorphis Bridge too, not sure how likely it is to happen at the moment sadly .. It still doesn't comply with LP Policy Des 3 i.e. “Planning permission will be granted for development where it is demonstrated that existing characteristics and features worthy of retention on the site and in the surrounding area, have been identified, incorporated and enhanced through its design.” The demolition of existing shops was always the biggest drawback of this application. Higher density... can transport/traffic in this area take any higher density? Probably not. I would rather it taller to drive down rental and owership prices, but thats too much to ask. People are soo conservative in Edinburgh. Firstly, cars in the city centre are a dying habit. Public transport is the future. Architectural proposals like this help public transport enhancements. Secondly, I wouldn't worry about following Planning Policy too rigidly. Nothing interestig would ever get built if you did. Besides. replacement commercial units form part of this proposal. This scheme will enliven the whole Foot of the Walk and that is more important than saving a vape shop and a pub where people play banjos.